Join us at Green Island Getaways at Granville on October 19th for PEI’s premier educational event on recreational legalization in PEI! 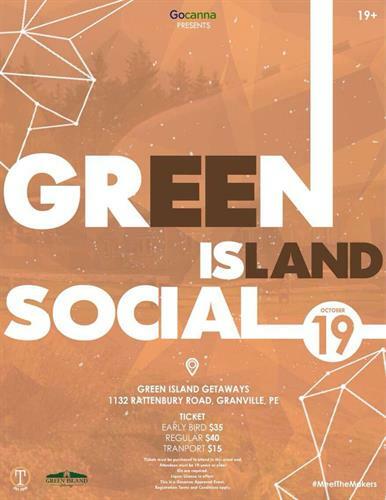 The Green Island Social is a Gocanna Approved evening of educational sessions to inform attendees on the recreational regulations in PEI and to allow attendees to meet with, learn from and connect directly with local community members, medical patients and industry experts. Attendees are invited to a series of information sessions, to network with presenters and to enjoy a variety of social activities including: a “Do You Know The Laws?” trivia session, performances by PEI’s finest fire dancers, live music, virtual reality and more! - Tickets must be purchased to attend in this event. Attendees must be 19 years or older. IDs are required. Liquor License in effect. - This is a Gocanna Approved Event. Registration Terms and Conditions apply.